The Zoe (and as far as I know, all Z.E. models) have at least three CANbusses: The main bus (Renault calls this the Vehicle bus), which is what the dongle connects to, a Multimedia bus, which is also wired to the SAE J1962 connector, but on pins 12 and 13 which are not wired in a cheap dongle, and the Electro CANbus, which connect the BCB, EVC, LBC’s and even the pedestrian horn computer. More on that last one in another post, but as a teaser, it is a serious (and expensive) computer! The Electro bus is gatewayed to the Vehicle bus through the EVC but of course this hides the goodies from priers like us. But don’t despair. In the Zoe, the Electro bus is wired to the cabin and there is a small connector. EDIT DECEMBER 2016: EVERYTHING BELOW THIS LINE IS WRONG. THAT CONNECTOR IS NOT THE ELECTRO CANBUS BUT A WIRE TO A SENSOR IN THE AIR CONDITIONER. I WILL POST AN UPDATE WITH NEW PICTURES IN A NEW POST SOON. 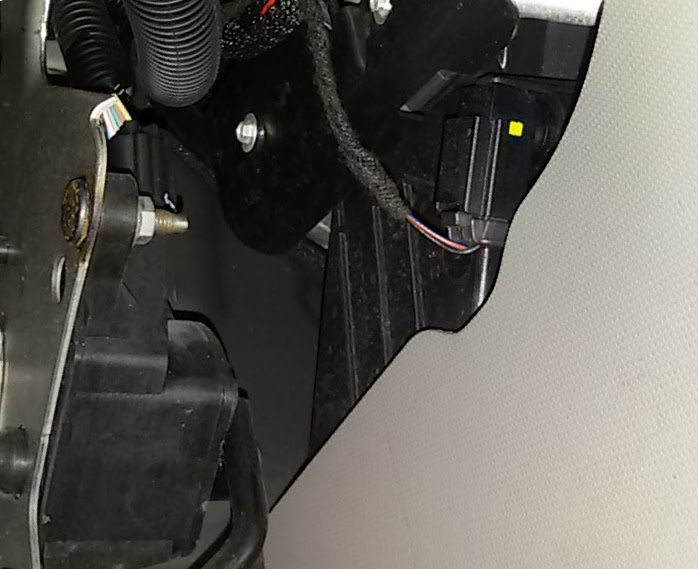 It is located to the right of the accelerator pedal against the middle console, and snugged in a blind (un-wired) connector. Here is a picture and we are looking up and a bit to the right from the accelerator pedal. for what purpuse is that connector down there? What dongle and software would you use to tackle this challange. Specifications totally unclear. These CANbusses are fast, and you need something with proper tools for debugging. I would use my Arduino Due and SavvyCAN. I had to take the car to garage to fix this. I unplug the connector to get a good look of it (can bus) and forgot to reatach it properly,so heating and cooling did not work ok.